The process of Teeth Whitening clears the stain and make your teeth look whiter. However, one should keep in mind that the results may vary from person to person. Are you dreaming of beautiful white teeth but worried about how a professional whitening will affect your tooth sensitivity? With Biolase Laser Whitening at Surabhi Dental, you can experience a significantly whiter smile without sensitivity. At Surabhi Dental, we see patients who really want whiter teeth but are anxious about the procedure based on one of the side effects of a traditional tooth whitening—tooth sensitivity. Many patients worry about how the procedure will affect their already existing tooth sensitivity, or if it will create tooth sensitivity for a patient who has never experienced it before. When you visit us at Surabhi Dental, we use Biolase Laser Whitening because patients have minimal to no sensitivity after the procedure. This is especially helpful for patients that regularly experience sensitivity. This system is effective yet much more gentle than other systems on the market. Our patients have been loving it! Biolase Laser Whitening makes it possible for patients of all different sensitivity levels to enjoy spectacular white teeth without the risk of accruing tooth sensitivity. Your dentist will first photograph your teeth which will help to know the progress of the treatment. This is also used to examine your tooth and figure out the stains. After examining the tooth dentist will start by cleaning the tooth. He will remove the film on your enamel coated due to the food you eat or due to other substances. The whitening process begins after this. The entire process takes around 30-90 mins depending upon the severity of the stains on teeth. Your dentist will cover the gums and will then apply the whitening agent on teeth. 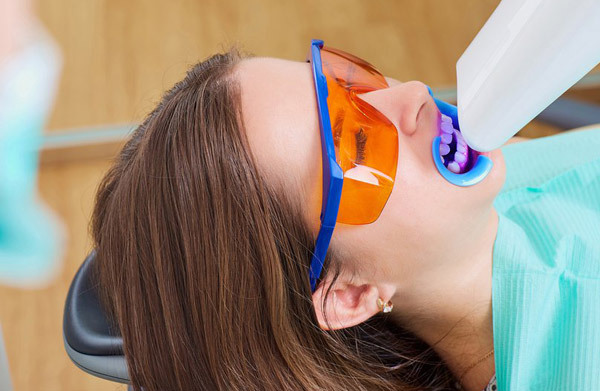 Some whitening agents require laser lights on them and if your teeth are badly stained then your dentist will suggest you continue the process at home for a few days. You can also opt for home whitening treatment, in this, your dentist will take an impression of your teeth and will make a custom fit mouthpiece. This helps the whitening agent to stay intact on your teeth. One can also buy over the counter whitening products which is suitable only for the teeth which are not heavily stained. IS THERE A RISK ASSOCIATED WITH TEETH WHITENING? Teeth whitening do not have any risks associated however, some people may feel sensitivity for a few days or can experience mild gum irritation for some days. Because Teeth Whitening is a cosmetic procedure it is not advised to pregnant ladies. They can get it done only after delivery. Q.1. How Often Should You Get Your Teeth Whitened? Professional Teeth Whitening lasts for about a year. Therefore, one should have a gap of a year in getting the teeth whitening treatment. If you are opting for home whitening treatment, then it can keep your smile intact for several months. Q.2. Can One Brush Their Teeth After The Whitening Process? One should not brush immediately after getting teeth whitening. Give your teeth a few hours and after that, you can brush your teeth but be gentle while brushing. Q.3. Is Teeth Whitening Permanent? The procedure varies from case to case. It may last from a few months to up to 3 years. However, if you smoke or chew tobacco or consume tea & coffee frequently then the whitening effect might not last long. Q.4. What Is The Cost Of Teeth Whitening Treatment? The cost varies from case to case and a visit to a dentist will only be the right context of knowing the cost involved.